The developers of Coravin have issued a warning to buyers after learning that a small number of bottles have split open when put under pressure by the wine preservation system that launched last year. Coravin said in a statement yesterday (3 June) that it knows of seven instances of broken bottles, with ‘one report of laceration’. It has stopped shipping the product while it investigates. The Coravin system uses a thin needle inserted into the cork to withdraw wine, and replaces it with inert argon gas to protect the remaining wine from oxidation. It was developed by MIT graduate and medical technology expert Greg Lambrecht and has sold 40,000 units since its 2013 launch. ‘In all instances, our customers sent us back both the [broken] bottles and the Coravin, so we were able to inspect them,’ Lambrecht told Decanter.com. He estimates the risk of a bottle having that type of weakness is one in 78,000. ‘The vintage doesn’t seem to be a factor; it’s a fault could happen at any stage in the manufacturing or transportation process, even if highly unlikely’. Coravin is presently on sale in the US and the company said it has voluntarily reported the issues to the US Consumer Product Safety Commission. ‘We will provide all existing and future customers with a remedy package that includes a neoprene wine bottle sleeve for use with the Coravin System,’ Lambrecht said, adding that he expects that solution to be ready within the next month, and that until then no new Coravin devices will be sold or shipped. Coravin’s argon gas exerts around 1.5-1.7 bar of pressure of the bottle (22-25PSI). An average wine bottle, according to industry figures, should be able to withstand an internal pressure of up to 10-15 bar. 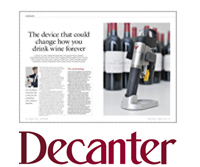 Decanter magazine is undertaking a year-long experiment with the Coravin device, in a tasting trial conducted by consultant editor Steven Spurrier. The experiment will put the device through its paces in a number of scenarios, before delivering a final verdict in Decanter magazine in August 2015. Look out for a full introduction to our Coravin experiment in the August 2014 issue of Decanter magazine, on sale 2 July 2014. Or subscribe now to reserve your copy.